Enjoy - Food & Travel: Scituate in the film "The witches of Eastwick"
The film "The witches of Eastwick" was recorded in the neighbouring city of Cohasset. Still, Scituate has a place in it as well. Do you remember the little shop where Alexandra Medford (Cher), displayed her Booby-statues, and where she found out that Daryl van Horne (Jack Nicholson), had bought them all? Yes that scene was shot here, in the Quarterdeck, situated in Scituate harbour. 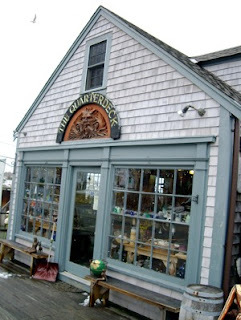 This charming little shop of nick-nacks incorporates all what I love with the New England Coastline.